“Given the sociopolitical oppression surrounding immigration process in Bermuda, and the growing unrest in the community, CURB urges Government to do the right thing for all the residents of this island, put their current immigration proposals on hold,” Citizens Uprooting Racism In Bermuda [CURB] said today. This latest statement from CURB follows after weeks of debate over the proposed ‘Pathways to Status’ immigration reform, which proposes changes including any person who is ordinarily resident in Bermuda for 15 years becoming eligible to apply for permanent residency, and any permanent resident who is ordinarily resident in Bermuda for 20 years becoming eligible to apply for Bermudian status. The group said, “The fact that the proposed immigration legislation was written prior to any announcement validates that there never was any real intent to collaborate or receive feedback from the people of this community. “We understand that this legislation is due to be tabled on Monday 7th March, a mere 4 weeks after the immigration proposals were announced, which means it will likely go before the House of Assembly for debate on Friday. “The Government’s continued failure to take a step back and consider immigration reform, that will democratically allow everyone’s voices to be heard, speaks to their intractability and their commitment to force this legislation through as quickly as possible. We are in a state of crisis. The Government refuses to listen to the majority of the Black community and is pursuing a course of action which will bring the country nothing but turmoil and increasing racial division. The fact that the proposed immigration legislation was written prior to any announcement validates that there never was any real intent to collaborate or receive feedback from the people of this community. We understand that this legislation is due to be tabled on Monday 7th March, a mere 4 weeks after the immigration proposals were announced, which means it will likely go before the House of Assembly for debate on Friday. The Government’s continued failure to take a step back and consider immigration reform, that will democratically allow everyone’s voices to be heard, speaks to their intractability and their commitment to force this legislation through as quickly as possible. Their actions are creating a rapidly spreading sense of outrage, frustration and disappointment in the Black community. It is pushing Black Bermudians towards action that they do not want to take but feel that there is simply no other recourse. Why the hurry when a simple step back and creation of a Parliamentary committee to consider all aspects of immigration reform could easily diffuse the current unrest? Why the hurry when the majority of those individuals who have been here 15 years or more will continue to be here and contribute to, and benefit from, Bermuda’s economy while the process of immigration reform is discussed? CURB calls that this process must be inclusive of every stakeholder in the community. Isn’t this democracy? Looking at the current immigration proposals, CURB believes that if the legislation was subjected to an Equality Impact Assessment it would never be passed in its current form. With Black Bermudians already out of work in their thousands, and the last census showing Black Bermudians to be statistically more likely to be fired first, hired last, made redundant quicker and employed as part-time employees, with no benefits, this legislation will only make a desperate situation far worse for the Black community. CURB believes that the passing of this legislation will, in one generation, change the socio-political, environmental, racial, and cultural face of Bermuda. Opportunities for Black Bermudians will continue to worsen, and force an even greater exodus overseas in the search for work to support their families. Black Bermudians understand and recognize the pattern, and thus are turning out to protest in their thousands. The history of immigration in Bermuda clearly articulates the physical, political, and mental abuses imposed upon Black people in Bermuda. Immigration in Bermuda has always been racial and politicized. The powers-that-be used immigration and voting restrictions to decide who they wanted on the island, who should go and who could vote. West Indians too have suffered historically being denied and/or marginalized in their attempts to immigrate to Bermuda and/or later seek status. Reasons given by the oligarchy was their perceived aggressive character and possible ‘bad’ influence on Black Bermudians. There is an ongoing history of marginalization and abuse of people of colour and today the Philippine community are the latest recipients of economic abuse at the hands of the establishment. There are some human rights that are now considered to be so universal that they are binding on all countries whether or not they are signatories to the relevant International Conventions. For example, a country that uses state laws and powers to torture people violates human rights even if it has not signed the Convention against Torture and Other Cruel, Inhuman or Degrading Treatment or Punishment. There is no such universal international human rights standard that requires states to give citizenship rights, such as permanent status and the right to vote, to long-term guest workers. The Government has failed to provide an example of a small country that grants such citizenship rights on a wholesale basis without quotas. CURB calls on government to produce examples of small jurisdictions that allow status/citizenship without quotas. It is our understanding that, in fact, the international standard for small jurisdictions actually allows for an exemption to the granting of citizenship rights to guest workers in view of the impact on a small host population and imbalances that would likely result. Indeed, there is a persuasive argument that the impacts of allowing significant numbers of guest workers to obtain citizenship would contravene the human rights of the host population. In Bermuda, where there is a statistical negative impact on one race, the human rights of Black Bermudians may well be infringed by such legislation. This is particularly poignant in light of the historical imbalances and impact on the financial and voting power of Black Bermudians that we witnessed into the 1970s. Historically there is absolutely no question that Bermuda’s immigration laws were used to violate Black Bermudians’ human rights. The Universal Declaration of Human Rights is mentioned in our own Human Rights Act. The intent of this current immigration legislation will continue the violation of Black Bermudians’ human rights in the country of their birth. Given the sociopolitical oppression surrounding immigration process in Bermuda, and the growing unrest in the community, CURB urges Government to do the right thing for all the residents of this island, put their current immigration proposals on hold and allow the people of this country to sit down together and discuss the best way forward. More thinly veiled threats from the PLP. I still cannot understand why a club calling to uproot racism is so black black black, colour, colour, create divisiveness etc. My kids are colour-blind thank God. Well if they’re Black, they’ll experience some form of racism in their lifetime. I have experienced physical and verbal assaults for just being a white boy in the wrong place. And on more than one occasion. My sibling was treated the same way. So do not pretend like it is a one way street. Cause that is what turns many people off from discussing racism (i.e. dismissal of others experience). and if you’re White, you’ll experience racism too! If CURB still exists it increases that chance ! CURB is perpetuating a division on race. Well done CURB, you create racists ! You are part of the problem , not the solution ! Understatement . . . Instead of trying to unify all races, & ethnicities, etc., they believe in divisiveness! They are probably backed by EWB too! CURB is an irrelevant organization led by a hypocrite. “Growing unrest”……well, true. From 15 that drowned out the town hall to 50 at Government offices to then a massive and overwhelming 175 at Cabinet. Definitely a “majority” of the black community…..
Nice to see the bottom line here though; ‘black community’. It’s never really been about Bermudians per se and at last we have some honesty. Although quite how this legislation disadvantages the black Caribbean immigrant folks living here, or a black contract worker, I just don’t understand. But that’s CURB for you. Thanks CURB, another xenophobic rant. I urge the OBA to just ‘get it done’ asap so that this anti-government nonsense can end and we can move on to more important issues. The PLP didn’t / couldn’t ‘get it done’ and have destroyed Bermuda. Where were these CURB people back in those days??? That is stupid. the OBA are there for all Bermudians….THE PLP created the mess…what kind of idiot are you that you cannot grasp this simple fact. The OBA is a fully inclusive of all party. I am not blind I am not an OBA supporter, I am a Bermuda supporter..I don’t get weighed down in political bias….I see what is actually happening, how it impacts now in the future and how it impacts everyone. I also can see what is actually happening, how it impacts now in the future and how it impacts everyone. You are ‘a Bermuda supporter’ and that explains it ALL. I am a supporter of BERMUDIANS!!! Bermuda is Bermudians fool ! The PLP has caused this problem why do you think our country is in debt, so before you start acting like a BLIND DEFENDER get your facts straight and stop talking about something you know nothing about. If you truly don’t see why the OBA had to add to the debt than you truly are an idiot! Jus’ Sayin! I cannot understand how a white expat can claim to speak for the Black Community am I the only one who see the hypocrisy ? as for bipartisan how does shouting and not letting the other side speak equate to bipartisanship…. They voted for you, now jam it down their throats – no mercy OBA. The new votes will allow the OBA to control the House of Assembly for another thirty years. They did not like their previous masters – how do you like the new ones? And what exactly is CURB proposing? And the PLP? All we hear is shouts to not go ahead, but never once has an alternative been offered for consideration. Bi-partisan approach,Immigration is not a PLP or OBA issue, it’s a Bermudian people issue. “thoroughly look into it from a case to case basis” is not a suggestion! That is just asking for favoritism and discrimination. This is why we have laws, so that everyone gets equal treatment. It is unfortunate that as a result of the way our politicians decide to do things we open up old wounds that polarize us as a community. It then becomes personal quickly. Ms. Winfield who makes an effort to study our community and speak about injustices is vilified by some for beating a social justice drum as a white expatriate who earned her status the only way she could – she married a Bermudian. It quickly devolves into a conflict of right or wrong and we chose sides – ignoring that we are all connected to this island, our economy and each other. Our frustration mask what we deeply desire and only articulates what we don’t like. We continue to generate breeding grounds for resentments on various issues thinking if we are more intelligent, forceful or passionate we can solve our communities suffering. I appreciate Ms. Winfield’s efforts and those of Mr. Fahy – they are both Bermudian. What if we accept they are both entitled to their beliefs and actions. What if we let go our our desire to make one them right or wrong? What would our next move be then? If you listen – you will understand how this proposed legislation would disadvantage the Black Bermudian population. If you and your family have been in Bermuda for (even a generation) – you would know why this unplanned, untimely and biased proposal “is not the answer” for Bermuda. 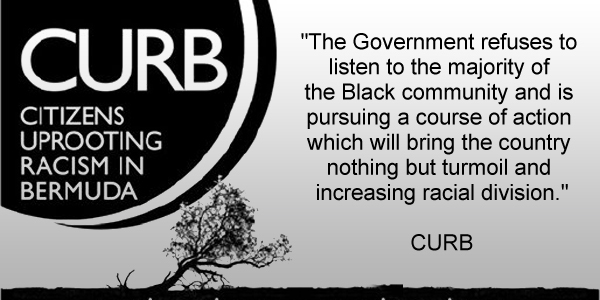 Where was CURB when the UBP/OBA ruined bermuda with their segregational and racial policies ? I wish CURB was there then. I see the PLP has taken over another organisation in Bermuda. Nationalism disguised as the fight for racial equality. Interesting play. Highly effective too so long as they don’t have to put forth counter proposals. Reap all the political gains from inciting rage against the government while not having to spend a moment of time addressing the issue itself. The trick is that by fighting against the future by utilizing our history we squander the present. Rather use the lessons of history to inform our present and build a better future. Let’s be real, the official slogan for this reform needs to be “Make Bermuda Great Again!” and most of these people would vote for a version of Donald Trump. We are one people..stop trying to divide us CURB. Ya but only one group of people have de cards stacked in their favour. This is not your role. Please review the reasons(aims and objectives) why your organisation came into being. By publicly making such a statement you are setting double standards as there are persons of all races and backgrounds on both sides of this proposal. your very organisation has persons on both sides of this proposal so please act like the NEUTRAL party you are supposed to be. if anything I have said there is wrong, then please publicise your aim and objectives and your membership, including executive. You need to stop dividing us based on colour of our skin…WE ARE ONE PEOPLE. Stop holding Bermudians back CURB !!!!!!!! CURB have lost their way. State of crisis?!?! Seriously!!! I really do have to wonder about my fellow Bermudians sometimes. Have a read up about the refugee crisis in Europe and then talk to me about crisis. In Bermuda its Legal Refugees. Boy, does Onion Juice need to get a life! Seriously, do you just believe everything you are being fed without question??? Do your research and then make an informed decision. It is clear that Winfield has issues, and that goes for anyone who is a member of CURB, which is by the way the most racist group anywhere on earth. Blind to its own hypocrisy to make it worse. And the OBA is not and never was against blacks. CURB is more than entitled to voice its concerns, as an organisation. It can speak for itself and its members. It cannot and does not speak for the entire Black Bermudian community. To presume it does wildly overestimates both its mandate and importance. I find the PLP’s re-writing of parliamentary democracy interesting. When the PLP is in power, it is elected to lead, and did so with impunity. When another party is in power, the PLP believes we should return to an Athenian-style full democracy, where every law involves all the populace. And worst of all, the final weapon that the PLP believes is its right to bear is the not-at-all-veiled threat of civil unrest. Is this honestly the view of PLP supporters? I noticed how not once CURB provided any examples of how black Bermudians human rights would be violated. And why pretend like you are concerned about the treatment of West Indians and Filipinos when you are simultaneously speaking out against them with the above tripe? It’s worth noting that the number of people who showed up at the March 4 demonstration would have been even higher if some unnamed individuals weren’t threatened with the prospect of losing their jobs if they attended. Their employers are probably behind 95% of the Comments section of this article. If your’re PAID TO WORK than you have to show up at work regardless of what job you have. Why would your boss give you time off to go to a rally…people would abuse the time off even if they don’t support the cause. Could have just went on your lunchbreak, breaks, etc. They weren’t threatened it just says in most peoples job descriptions you can’t just get up and leave your job. I see Sir Issac Newton’s third law of motion is in full bloom for all too see some of our government leaders should have stayed awake in science class.